Numerous wearable data transmitters, and biosensors and similar tech advances for personal health monitoring have now been miniaturized according to materials chemist Trisha Andrew at the University of Massachusetts Amherst. However, they require energy, and power sources can be bulky and heavy. Without power, they become essentially useless, like in the image above of a group of wearable devices without any power. Now Trisha and her Ph.D. student Linden Allison report that they have created a unique fabric that can harvest body heat to produce enough electicity to power small, wearable microelectronics like activity trackers. In an early online version of Advanced Materials Technologies, Andrew and Allison describe how in theory, body heat can produce power by using the “thermoelectric” effect that takes advantage of the difference between body temperature and ambient cooler air. In this way, materials with high electrical conductivity and low thermal conductivity can move electrical charge from a warm region toward a cooler area. For this development, the researchers exploited the naturally low heat transport properties of cotton and wool to produce thermoelectric garments that can maintain a temperature gradient across an electronic device known as a thermopile. The thermopile they created converts heat to electrical energy even over long periods of continuous wear. This long-term reliability is a practical concern to ensure that the conductive material will be mechanically, electrically, and thermally stable over time, Andrew indicated. Specifically, they produced their all-fabric thermopile by vapor-printing a conducting polymer known as persistently p-doped poly(3,4-ethylenedioxythiophene) (PEDOT-Cl) onto one tight-weave and one medium-weave kind of commercial cotton fabric. Then, they integrated this thermopile into a custom-designed, wearable band that generates thermo-voltages greater than 20mV when worn on the hand. They used a custom-built probe to measure the surface electrical conductivity of the coatings and observed that the looser weave cotton showed higher conductivity than the tighter weave fabric. The conductivities of both materials “remained largely unchanged after rubbing and laundering,” they added. With a thermal camera, they proved that the wrist, palm and upper arms of volunteers radiated the most heat. 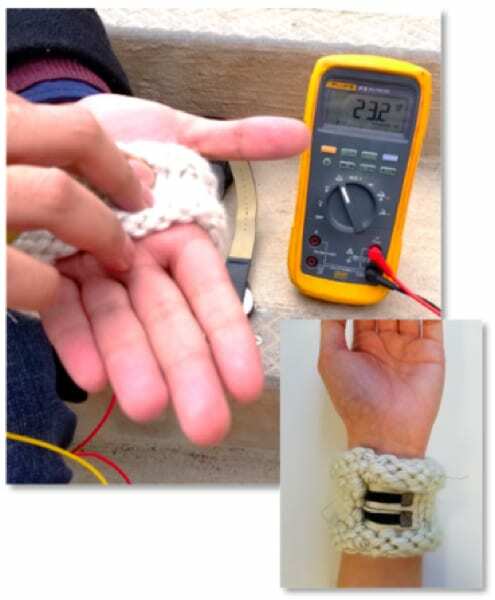 So, Andrew and Allison made stretchy knitted bands of the thermoelectric fabric that can be worn in these areas. The yarn’s thickness insulates the air-exposed outer side of the band from body heat. Only the uncoated side of the thermopile touches the skin to reduce the risk of allergic reaction to PEDOT-CI, they noted. The researchers pointed out that perspiration significantly raised the thermovoltage output of the stretchy armband, which was expected, as damp cotton is known to better conduct heat than dry fabrics. They were also able to deliberately turn off heat transfer by inserting a heat-reflective plastic layer between the wearer’s skin and the band. Funding for this work came from the National Science Foundation and the David and Lucille Packard Foundation.